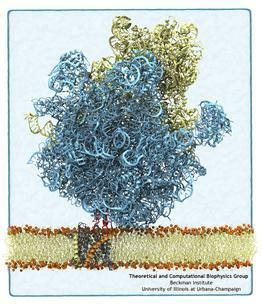 Living cells contain millions of proteins composed of sequences of different amino acids that typically fold spontaneously into well-defined three-dimensional conformations and then carry out their role as molecular machines serving manifold functions in the cells (see the protein folding highlight). The synthesis of the proteins is carried out by the ribosome, one of the largest molecular machines present in all cells, which reads the cell's genetic information for the purpose. Three researchers were recently awarded the 2009 Nobel Prize in Chemistry for the determination of the ribosome's structure. The physical mechanism of the ribosome, the cell's protein factory, is still largely unknown. Just as in any factory, there are multiple directions and controls on the protein assembly line. Sometimes the protein products need to be redirected to different parts of the cell, and other times assembly needs to be halted altogether. Now, significant new insights into both of these aspects of protein assembly have been made by combining electron microscopy with molecular dynamics simulations using the recently developed molecular dynamics flexible fitting method (MDFF, see the June 2008 highlight). This combination allowed researchers to visualize the complex between the ribosome and a protein-conducting channel that directs proteins into and across membranes for both a mammalian system (reported here) and a bacterial system (reported here). Amazingly, despite the evolutionary distance between mammals and bacteria, both complexes are remarkably similar. Simulations of the bacterial ribosome-channel complex, among the largest ever performed, further revealed the steps in the direction process. In a third study (reported here), researchers determined how TnaC, as a protein newly synthesized by the ribosome, can stall the ribosome from within during its own assembly, which then controls the expression of related genes. More information on these unique protein assembly controls can be found on our ribosome and our protein-conducting channel websites. James Gumbart, Leonardo G. Trabuco, Eduard Schreiner, Elizabeth Villa, and Klaus Schulten. Regulation of the protein-conducting channel by a bound ribosome. Structure, 17:1453-1464, 2009. Thomas Becker, Elisabet Mandon, Shashi Bhushan, Alexander Jarasch, Jean-Paul Armache, Soledad Funes, Fabrice Jossinet, James Gumbart, Thorsten Mielke, Otto Berninghausen, Klaus Schulten, Eric Westhof, Reid Gilmore, and Roland Beckmann. Structure of monomeric yeast and mammalian Sec61 complexes interacting with the translating ribosome. Science, 326:1369-1373, 2009. Birgit Seidelt, C. Axel Innis, Daniel N. Wilson, Marco Gartmann, Jean-Paul Armache, Elizabeth Villa, Leonardo G. Trabuco, Thomas Becker, Thorsten Mielke, Klaus Schulten, Thomas A. Steitz, and Roland Beckmann. Structural insight into nascent polypeptide chain-mediated translational stalling. Science, 326:1412-1415, 2009.